Welcome to Tuesday morning, friends. I have got you COVERED. Today is going to be a good day. Oh yes. To all those who know me well, coffee is a lifeline in the mornings. I am, admittedly, a BIG fan of the caffeine kick in the mornings. Not only that, but I genuinely LOVE the taste of coffee. Even more so, I love the RITUAL of morning coffee. 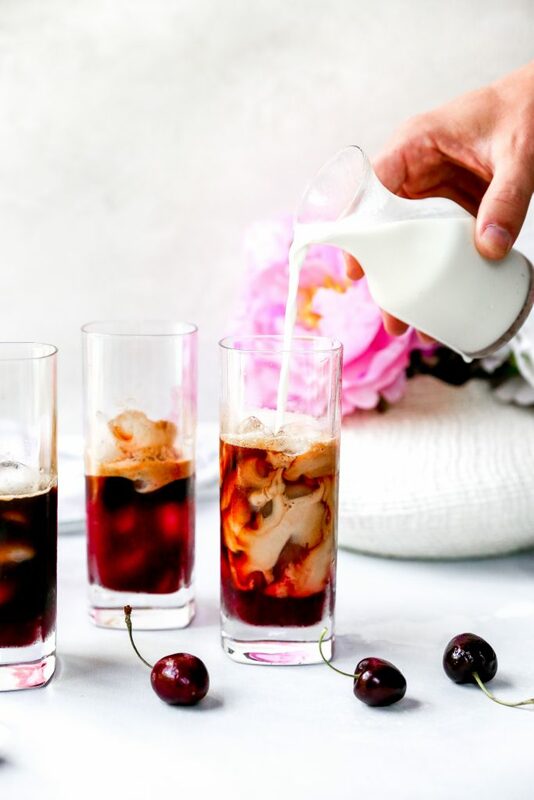 There is nothing better than sitting down with a hot (or iced!) cup of joe in the morning, just as I’m getting my day started. I often sit, sipping on it slowly, and allow myself to be surrounded in the anticipation of the day to come. On days that I’m not in the office and home with Kieran, I purposely wake up extra early so that I can sneak downstairs in the soft light of dawn, when the house is completely quiet except for my footsteps and my dog’s nails gently and rhythmically clipping the hardwood floors as he follows my every move, JUST so I can sip my morning coffee in peace. Just me. Alone. Savoring every sip. It really is a ritual for me, and I look forward to it every night as I’m falling asleep. Coffee is huge in my life. So! All that said, it shouldn’t come as a surprise that I love coming up with fun and interesting ways to consume that treasured morning elixir. Growing up, I loooooooooved cordial cherries. OMG. I lived for that creamy coating and slightly bitter chocolate. The maraschino cherry inside wasn’t too shabby either. I was often alone in my love for cordial cherries, though, as they seem to be a rather polarizing treat. Either you love ’em or you don’t like ’em at all. I’m definitely in the loving ’em camp. And that’s where the inspiration for today’s coffee creation came from. Except there’s a more sophisticated and grown up twist! The cherries right now are INSANE. They are so juicy, so tender, and perfectly sweet. We’re eating them by the bagful, much to my bank account’s dismay (they cost a pretty penny, especially if you stick to organic like me). But no regrets! 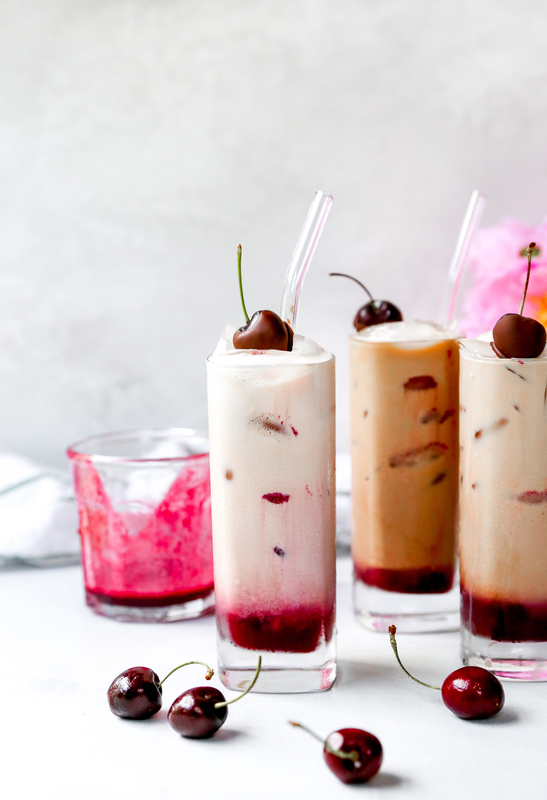 They are one of summer’s early and best treats, and I always go through a major cherry love affair this time of year. 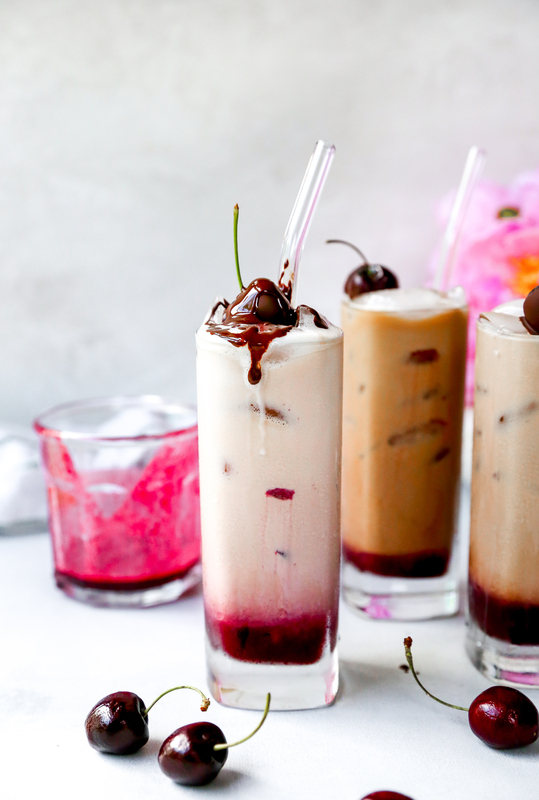 Recently, I was daydreaming about my cordial cherry days. I used to pick them out as a special reward every now and then. A whole box, with trays of the little morsels all lined up in neat rows. Totally spoke to my type A self, even as a child. I’d pop them in my mouth and let the chocolate melt away and reveal the creamy cherry center. Swoon! I was actually sipping my morning coffee as I relished in this memory. Then it hit me! Why not try out a cordial cherry coffee?! It combined two of my favorite things, one from childhood, and one from adulthood. It was meant to be, folks. I immediately brainstormed a recipe and started testing and tweaking in my kitchen. 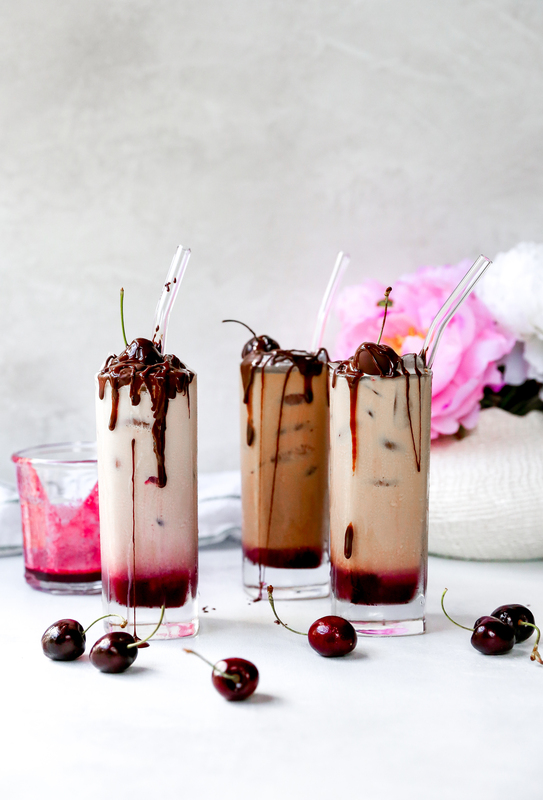 And these chocolate covered cherry lattes were born! I’m serving them up iced because, well, it’s HOT out. And sometimes I just want that icy cold refreshing boost first thing in the morning. That said, you could definitely serve these up hot as well. The chocolate drizzle component would work dreamily in a hot version of these. 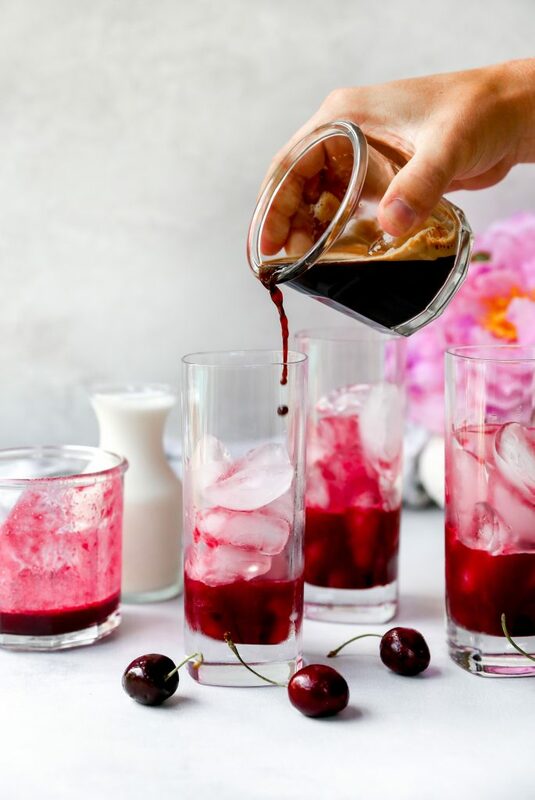 It starts with a simple fresh cherry syrup. You can make it a few days ahead and keep it in the fridge as you need it. Which means you can basically have these every day of the week. Yay! I put a few tablespoons of the syrup in glasses filled with ice. Next in is the espresso (or strong coffee!). It gets topped off with your milk of choice, cold. 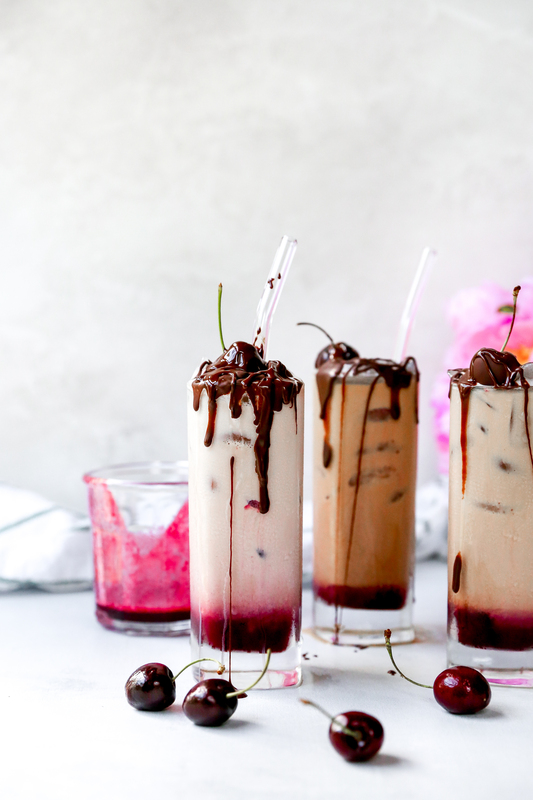 No need to steam it, since we’re making iced lattes today. Stir it all up with a straw or spoon and then add in an optional drizzle of chocolate sauce. 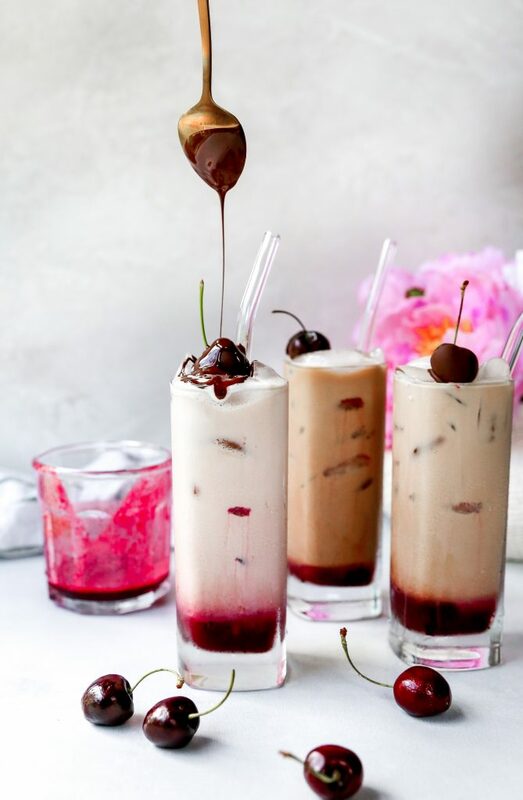 And if you’re like me and love chocolate covered cherries, pop one of those on top for garnish. Thank the heavens for coffee. 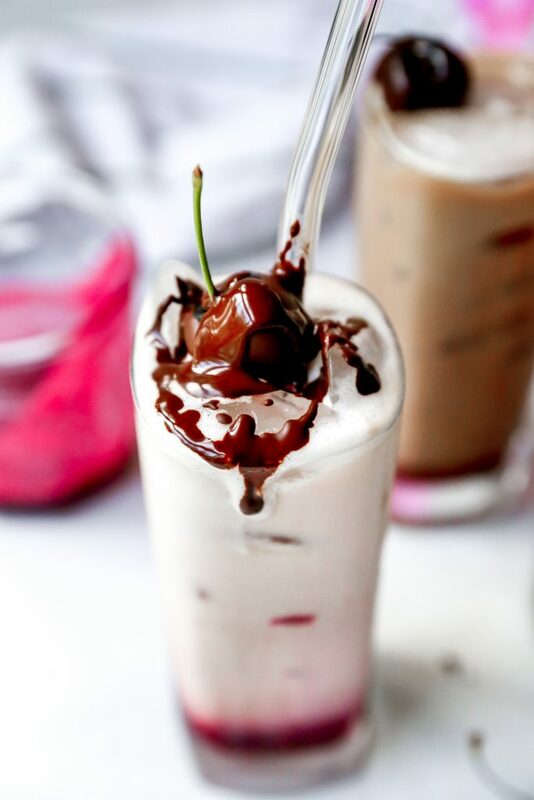 And cherries. And these lattes. Place the cherries, sugar, and water in a small saucepan over medium heat. Bring to a simmer and cook, stirring frequently, for about 5 minutes or until the cherries are very soft. Allow to cool before mixing in the vanilla extract. Once the mixture is cooled, place it in a blender and blend until smooth and pureed. If desired, pass the mixture through a fine-mesh strainer to remove any cherry bits (I skipped this part and wasn’t bothered by the tiny cherry pieces at all). In a small heatproof bowl set over a small pot of simmering water, add the chocolate and coconut oil. Ensure that the bottom of the bowl does not touch the simmering water. Stir the mixture until it is smooth and completely melted. 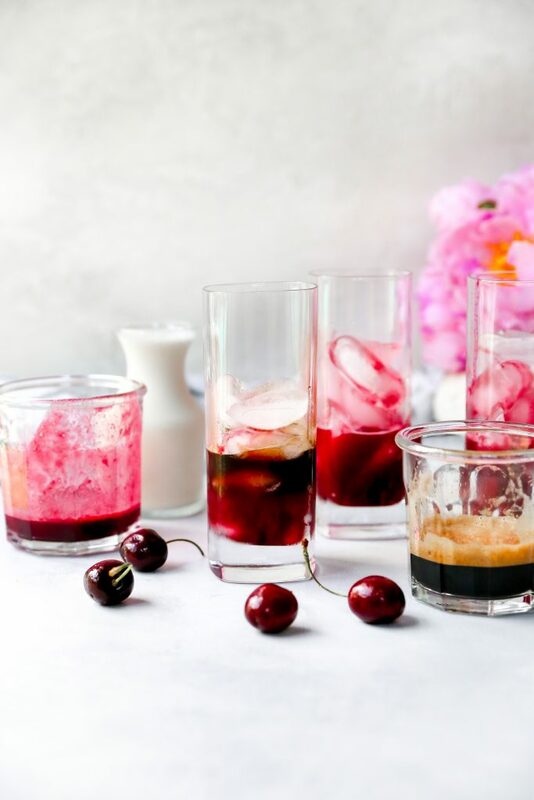 Fill two glasses with ice and add 1-2 tablespoon of the cherry syrup to each glass (depends on how sweet you want it). Add the espresso and the milk. Mix gently with a straw to combine. Drizzle in a little bit of the chocolate, or just drizzle it around the rims of the glasses. 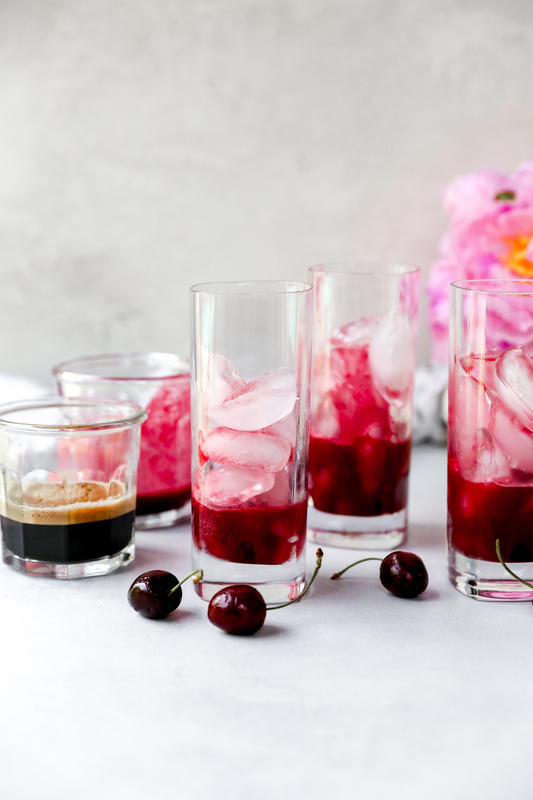 Garnish with the cherries and serve immediately! !!! These look completely amazing! Just when I thought I couldn’t love cherries anymore than I already do..